M-Lytic Audio Grade Power Caps: With the M-Lytic Audio Grade series we are extending our range of products to a series especially conceived for applications within the pre-amplifiers or small power amplifiers. The assemblage always refers to snap-in models for assembly boards. Throughout its development, importance was placed upon attaining low ESR and ESL values, as well as a low inner-sound development. Storage facilities are currently being constructed. Please feel hence free to enquire about the availability of the required merchandise. The ESL value is about 10 nH. 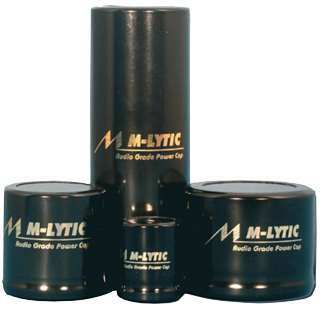 M-Lytic HV The MLytic HV electrolytic capacitors have been developed from the latest materials and under utilisation of the most modern manufacturing technique especially for the requirements of tube amplifiers. The 450 VDC versions have an axial construction form, whereas the 500 VDC types are offered in snap-in housings. Following many classic designs, these capacitors are offered as double capacity. In addition to the utilisation in new developments, they are also outstandingly suitable for repairs and tuning of existing amplifiers. The ESL value is about 20 nH.